A large proportion of our work involves contemporary exhibition design and the construction of bespoke furniture for exhibitions. We can quickly and dramatically change the dynamics of a given space by installing temporary partition walls as screening devices, which alter the orientation through a space, construct a 'reveal', or contain a space for specialist lighting or audio visual presentation. Additional walls can be used to discreetly house audio-visual equipment or to increase hanging space. Bespoke plinths made in various materials and finishes ensure an appropriate display for sculptural objects, whilst custom-made vitrines provide a more controlled presentation, offering protection to vulnerable works. 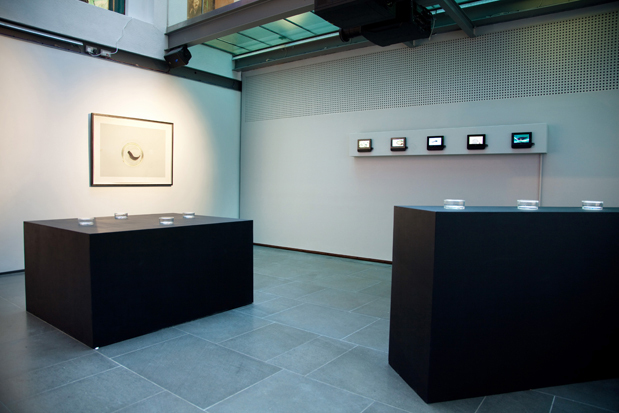 Light-box plinths and exhibition install. Fabrication and installation of bespoke light-box-plinths housing backlit specimen dishes. Hanging solution design and installation of audio visual presentations. at The Royal Institute, London, 2010 (photo: Kristian Buus).